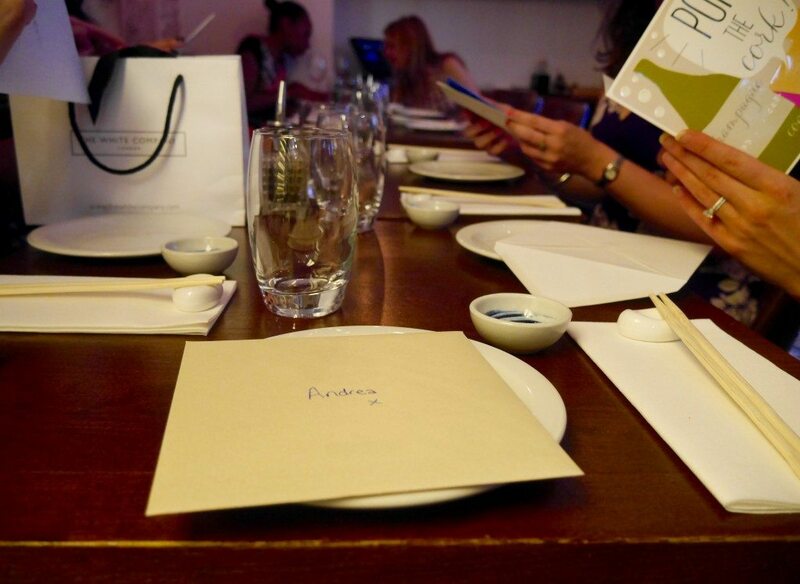 The ‘blogger sushi date’ was a much-anticipated event in my diary. Months ago, before any of us had had the pleasure of meeting one another, Jaime, Angie, Polly, Lauren and I decided that we should all have dinner together. 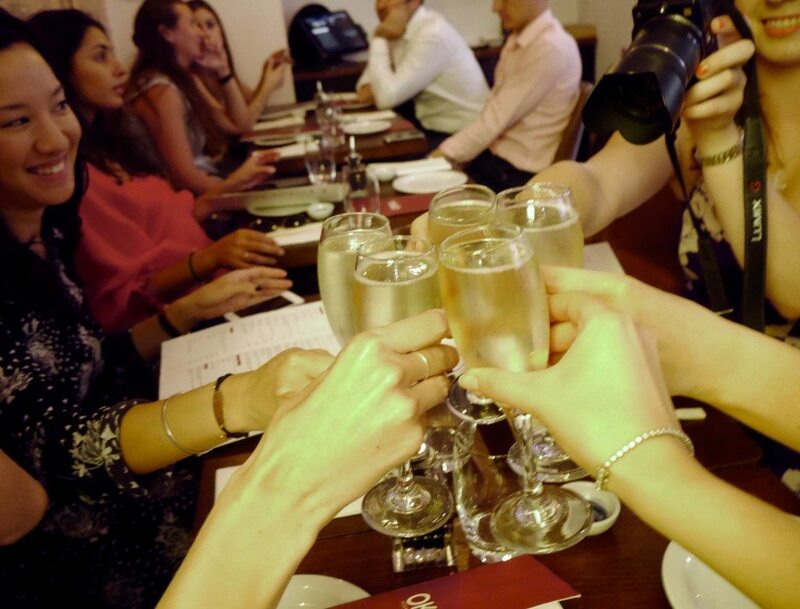 It didn’t take us long to settle on the cuisine – sushi, and what better a choice of venue for a bunch of food bloggers than a newly opened restaurant? 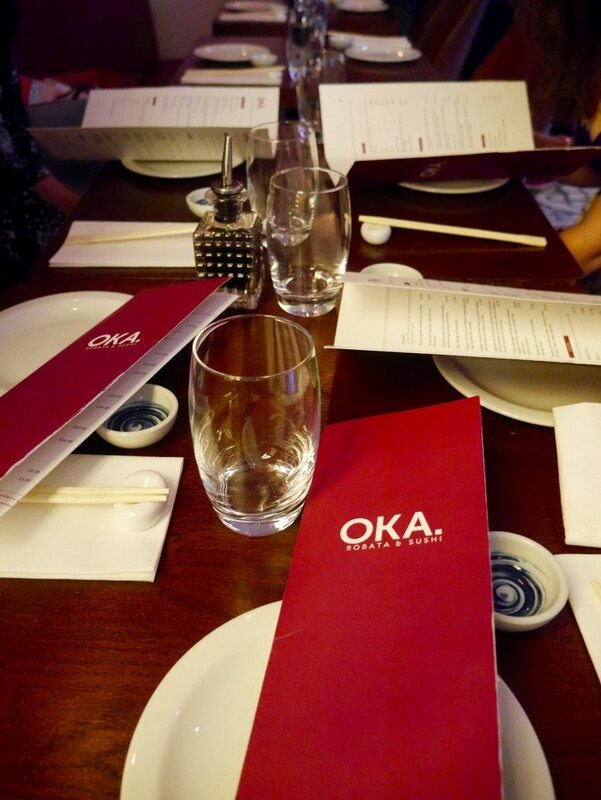 Hence the five of us headed over to Oka in Kingly Court two Friday’s ago for a smashing sushi date. Service: Service was very good throughout our evening. The restaurant is very small, which makes ensuring attention to diners relatively easy (in my opinion). But, not wishing to belittle this role or the service that we received, I will add that our waitress was indeed very friendly, and on hand whenever we needed anything. 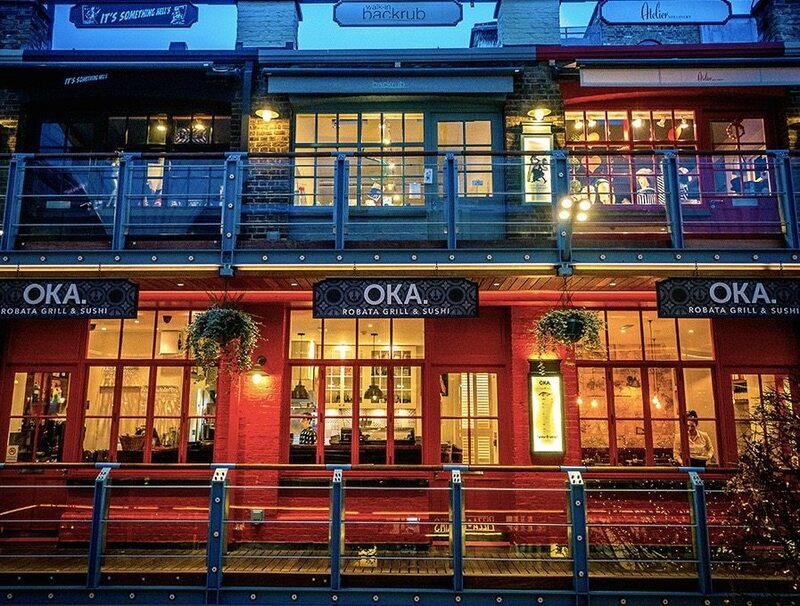 Ambience: Oka’s website describes the restaurant as ‘cosy’, which isn’t inaccurate, as such, however, I personally think a more apt word would simply be ‘small’. 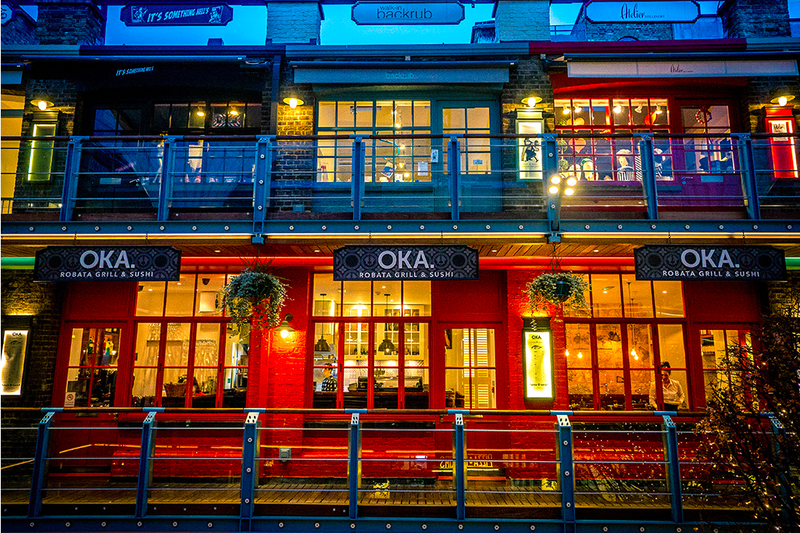 That’s not to say that I didn’t like the décor or atmosphere of Oka, I would just never refer to it as ‘cosy’. An ornate tiled floor and red-framed floor-to-ceiling windows fill the room with colour and bring it to life. In light of the scorching hot summer’s evening that we were all doing our best to embrace, the airiness of the place was particularly appreciated – Angie, Kam and I almost melted into one big fat puddle at Flesh & Buns the week prior. The back wall of the restaurant is covered in B&W maps, a feature that I really liked, and the hand-scrawled chalkboard menus add charm. 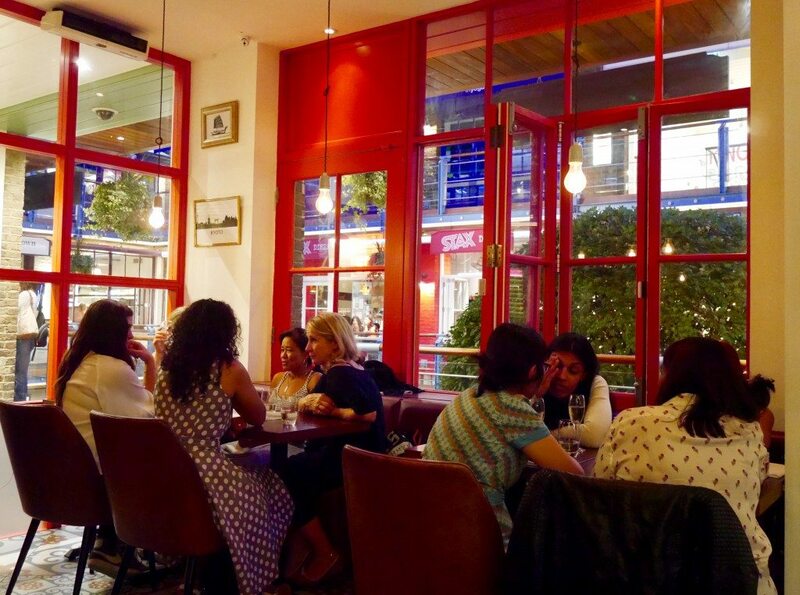 The restaurant has a very relaxed & upbeat atmosphere, and is an ideal spot for catching up with friends over good, well-priced food, which is exactly what we did. Despite our intention when organizing the ‘blogger sushi date’ that it would be the first time that we all met one another, good fortune meant that by the time the date rocked around, I had already met Lauren for dinner at Bob Bob Ricard, Jaime at a wine tasting dinner at Portland, and Angie for dinner at Flesh & Buns. However, none of us had yet had the pleasure of meeting Polly, since she lives in Doha and is therefore a little tricky to track down, so I was super pleased to learn that she is just as sweet in person as she is online, even bringing us all personalized cards… when she was the one getting married the following week! Clearly bubbles were in order, and we wasted no time getting a bottle of ‘NV Prosecco ‘Arcobello, Treviso DOC, Italy’ (£24.50). Food: Oka’s menu features both sushi and hot dishes. 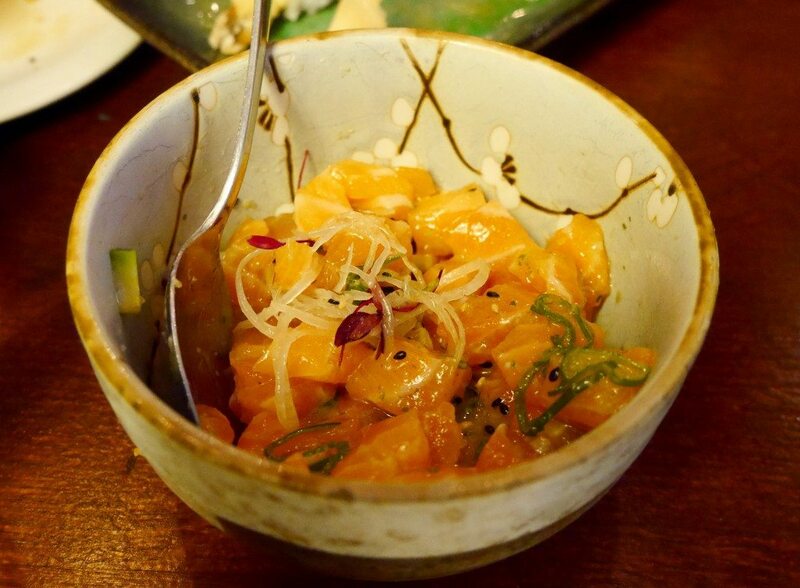 The sushi is handmade in front of you in an open kitchen, whilst the hot dishes are cooked out back. 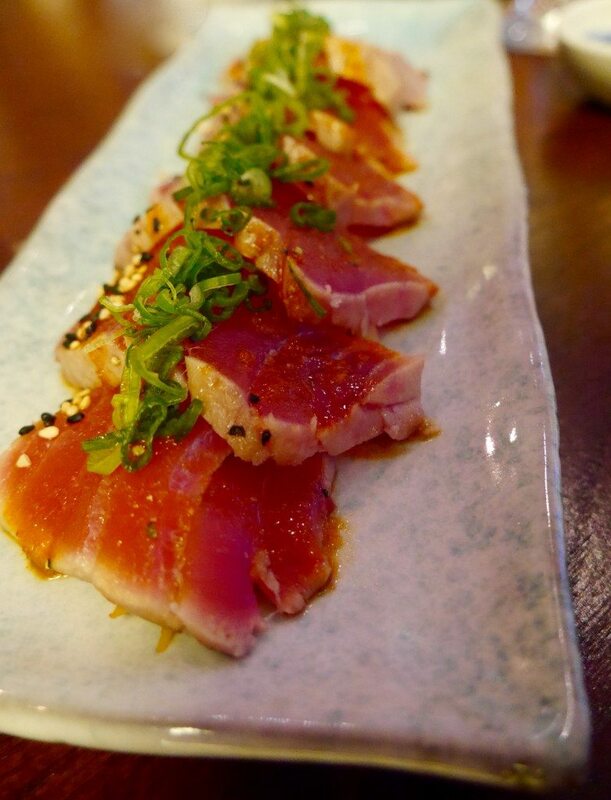 The first of our orders to arrive was tuna tataki, served on shredded cucumber with truffle oil, sesame seed, citrus ponzu and shisho crest (£9.50). Not a bad dish, but for the price I would have liked the tuna to be softer & creamier, as it was at Flesh & Buns and costed only 30p more. The salmon tartare (£5.95) was outstanding. A generous portion of good quality salmon that melted like butter in my mouth, and was served cubed versus minced (unlike at Roka), which is actually my preference. For me, it was definitely the stand-out dish of the evening, and was (almost) good enough to rival my own beloved tuna tartare recipe. Excellent value and super delicious, we ordered another just moments later (£5.95). Sushi-wise, we checked out two of Oka’s handmade rolls. 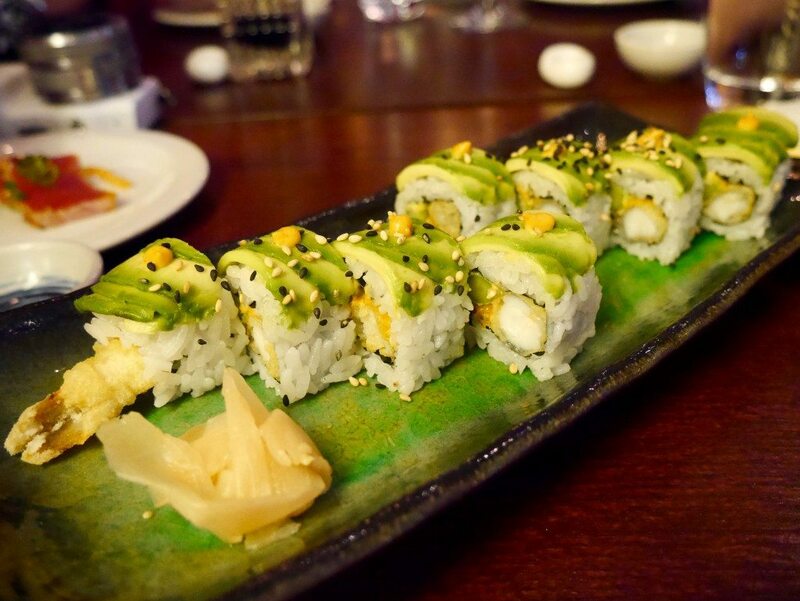 The first was the ‘dragon roll’, incorporating prawn tempura, asparagus, spicy mayo, and topped with avocado (£6.90). This was a flavoursome and generously filled roll. I love the crunch of prawn tempura in sushi rolls, and Oka’s version was texturally well-balanced by the smooth & creamy avocado. 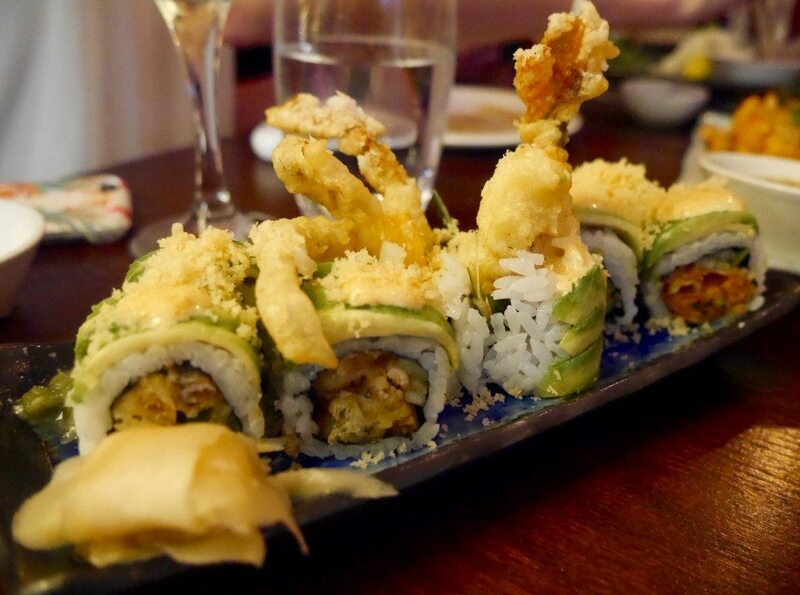 The second roll that we tried was the ‘spider roll’, stuffed with soft shell crab, kimchi, cucumber, wasabi mayo, and topped with avocado & tempura crumbs (£7.30). I tend to find soft shell crab disappointing due its soft crunch and lack of bite, but I was impressed with Oka’s serving. However, considering the almost identical and highly interchangeable ingredients list compared with the dragon roll, I thought that the two dishes were too similar in taste & texture, and that Oka should shake things up a little with regards to one of them! If I were to go back, I would stick with the dragon roll. 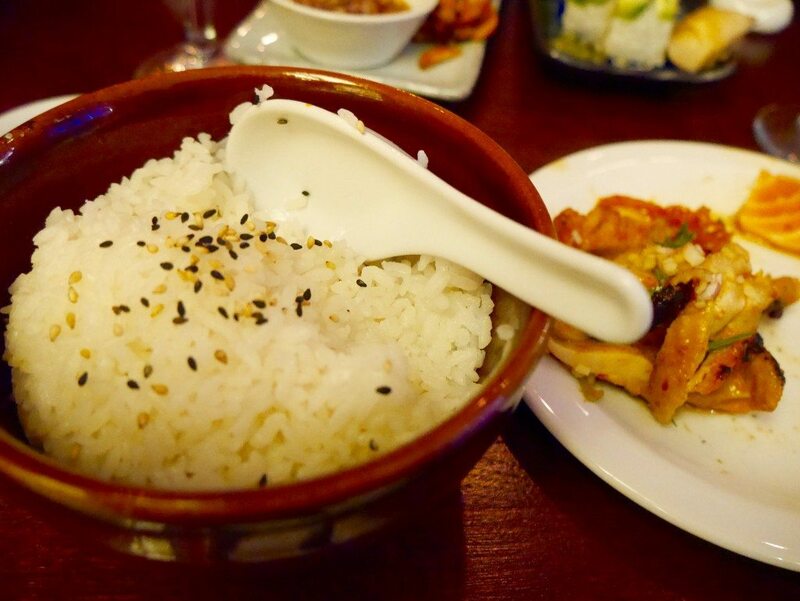 The last of our savoury dishes, and the first non-fish course of the night, was kimchi chicken served with ginger, shallots and red vinegar (£7.50). 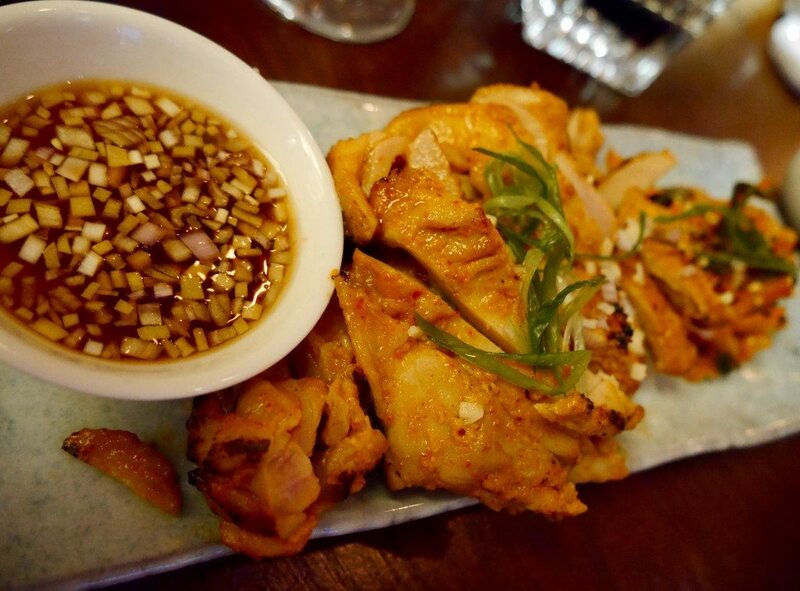 A substantial portion of juicy chicken, accompanied by a yummy, zingy sauce, went down a treat mopped up with a (very!) good bowl of sticky rice (£2.10). With Polly’s big day only one week away and plenty of other things to celebrate between us, we ordered another bottle of the ‘NV Prosecco ‘Arcobello, Treviso DOC, Italy’ (£24.50) to wash down pudding with – two orders of hot cookie dough with vanilla ice-cream, of which we tried both the standard chocolate chip and green tea flavours (£5.95 each). Aside from the famous dark chocolate and green tea pudding at Roka, I’m not a fan of green tea flavoured components in dishes, and knew that I would most certainly not be partial to a green tea cookie! 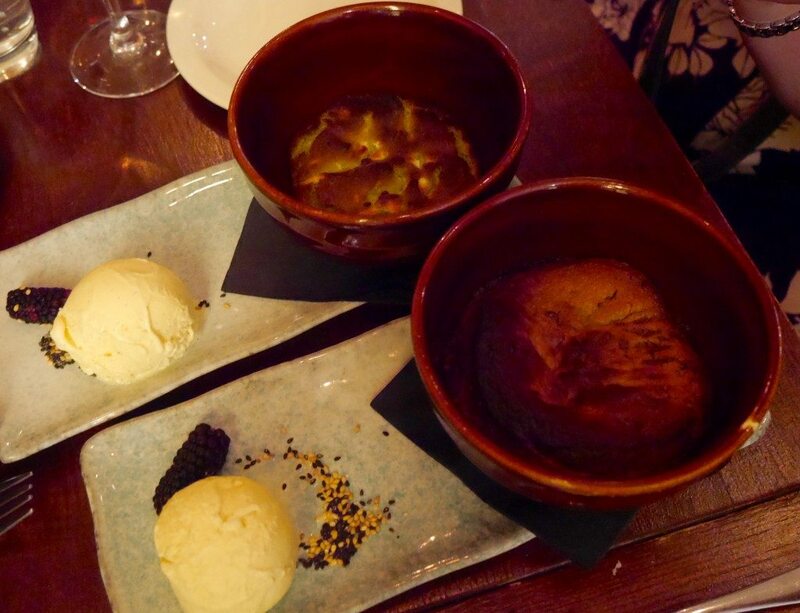 Some things are best kept traditional… a view that was very much confirmed to me when sampling these two puds. However, I must say that both were pretty unimpressive; small portions for the price, served mostly burnt and far too hot to eat, and reminiscent of a fairly average under-baked cake. I wouldn’t order either of them again. It was such a gorgeous summer’s evening spent in great company enjoying good food. 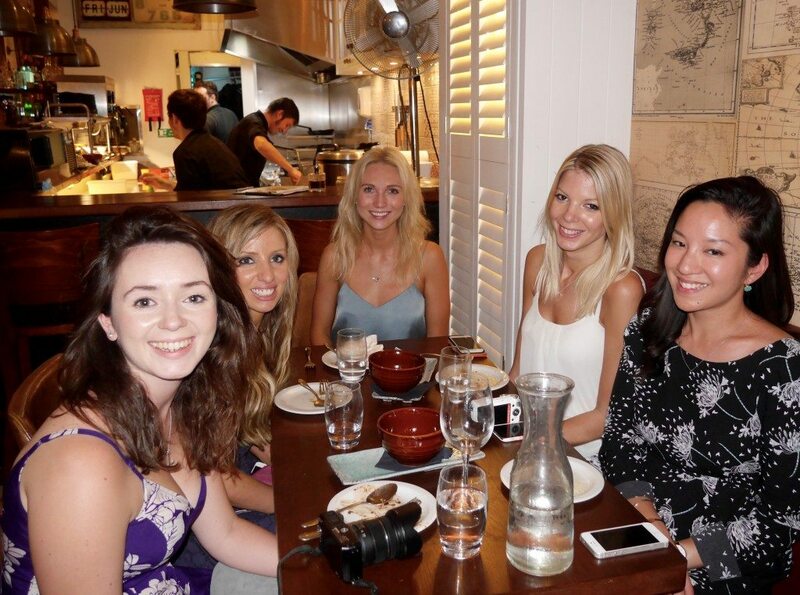 My favourite part about blogging is definitely getting to know people that have similar interests to myself, and I feel very lucky to have met these gorgeous ladies. Price: The bill was £128.30 with service, which worked out as £25.66 per person. 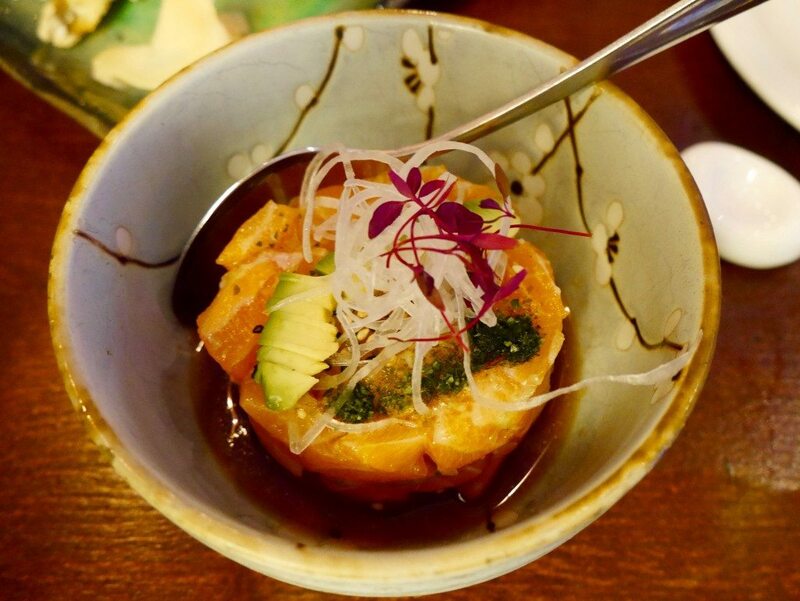 Although Oka is not my new favourite restaurant, and I have had better sushi elsewhere, it definitely ticks the box for decent sushi at a good price in a casual setting, and I would go back. This place looks great! I really love sushi! 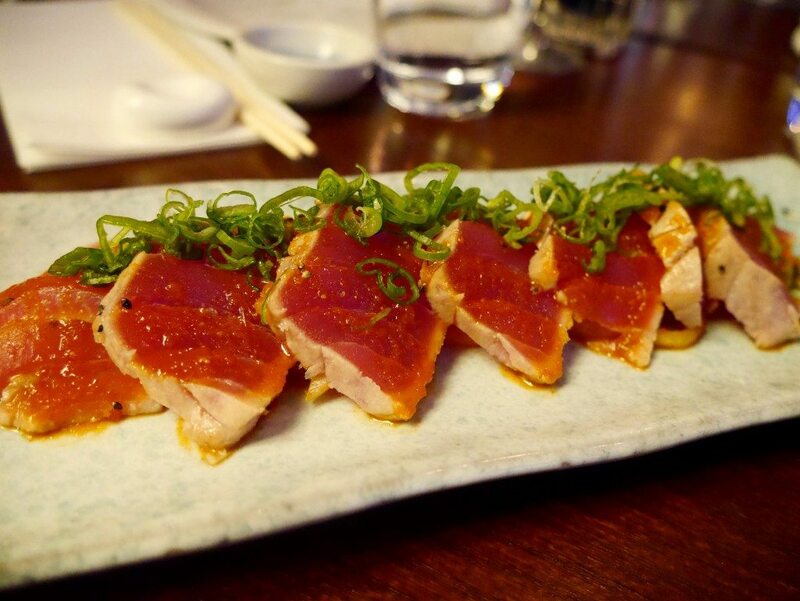 Looks like a great time and the sashimi looks really good! Reading this at lunchtime is dangerous, especially with your food photography! That is a very reasonable price for a London sushi restaurant! I also join an active bloggers group here in our city. In fact, I actually started blogging when I joined this group. We also do meet-up and at times the group got invited to try new resto in the city. Getting to know people that have similar interests or hobbies as you definitely great! Ohh I do love sushi! Will have to check this place out!